Today marks the first meetup of Brunei Geek Meet (http://www.meetup.com/BruneiGeekMeet/), a meetup where I hope to start fostering the meetup culture that I’ve been experiencing here in Melbourne. We aim to be run by the community for the community. 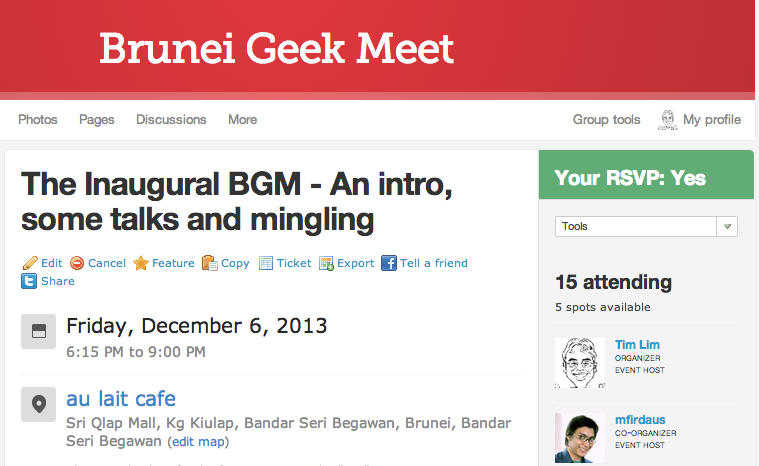 I believe that everybody has something to share and I want Brunei Geek Meet to be a platform for people to contribute to the community as a whole: be it as a learner, as a presenter, as a mentor, as a discussion starter, etc. We are more technology oriented (but are open to geeks of any kind!) and we intend to have talks, code labs, hacknights/days and other events where people can attend, learn and contribute in their own ways. I am also please to announce that we have a license to hold a RHoK event in Brunei. With the tagline “Hacking for Humanity” RHoK believes in providing a platform for people (particularly technologists) to do social good and make the world a better place. This is done by hackers working to solve a community problems which can be used in the region of the problem, and even to a bigger audience of the World. When I first attended RHoK, it brought me back to the days I was working on the SMARTER eCVS and I want RHoK Brunei to be of the same nature: for us to see a local need and for technologists to team up to work on a solution. With that, I would like to extend an invitation to any individuals or organisations that are facing or know of problems that could use a technological solution to get in touch with me and so we can kick off some discussion on how the developer community of Brunei could help. My contact details are tim@thewheatfield.org / @thewheat. I truly hope that you can be a part of RHoK and help contribute to the betterment of the Brunei developer community by providing a real world problem that we, as a community, can get together and help solve.